In November and December of 2009, I spent four wonderful weeks working with museums across New Zealand on strategies related to visitor participation (see the slides from seminars here). I learned a great deal – about bi-culturalism, creative ways of involving audiences in institutions, and the challenges staff at New Zealand institutions face in their work. There was one question that came up repeatedly during my time in New Zealand that I found it difficult to answer. Again and again, someone would raise their hand at a seminar about participatory engagement and ask, “is the desire to participate culturally determined?” I gave the best answer I could at the time—a qualified “sort of.” But now, six weeks later, I have more informed thoughts to share. Is the desire to participate in cultural institutions culturally determined? This question presumes two things. First, there’s the idea that not everybody wants to create content, share their own ideas and stories, or actively do work while visiting museums. And second, there’s the suggestion that maybe people from some cultures or countries are more interested in this than others. Let’s look at each of these separately. It’s absolutely true that not everyone wants to be an active participant in her own cultural experience in a museum. Even on the Web, where participatory activities are most frequently available, there is great “participation inequality” among those who choose to create, critique, curate, and spectate user-generated content. On sites like YouTube, Wikipedia, and Flickr, the vast majority of users are consumers, not creators. While participatory technologies have changed the kind of content available to consumers quite significantly, smaller percentages of people have chosen to actively produce their own content. For this reason, I often encourage cultural professionals to think “beyond creation” to other kinds of participatory activities that are more broadly popular, like voting for things, sharing comments, or collecting favorite artifacts or stories. For more information on different types of participation in a cultural context, I encourage you to check out this blog post. The answer, after much consideration, is no. I’ve researched and worked on participatory projects with people and museums all over the world, and while there are cultural aspects that often impact the participatory approach, the desire to participate appears to be universal. I have yet to meet people from any country who do not have personal stories, reactions, or creative impulses relative to cultural institutions that they would like to share. In Hanoi, at the Vietnam Museum of Ethnology, community members give voice to exhibits with their own stories and objects. In Barcelona, at the Museu Picasso, illustration students make art about their observations of the comings and goings of visitors in the museum. And in Wellington, at Capital E Theater, young immigrants co-developed an opera about their experiences with professional writers and composers. The desire to share personal stories, connect with others socially, and make a meaningful contribution to something larger than yourself are universal. In every society, there are particular hot issues or cultural preferences that make some kinds of engagement easier than others. For example, at the Vietnam Museum of Ethnology, they take a communal rather than individual approach to participation, encouraging groups of visitors to participate together intact. This fits with cultural preferences around deferring to elders and making decisions in a consensus-based way that doesn’t prioritize any single voice. In contrast, at the Art Gallery of Ontario in Canada, the In Your Face project, in which visitors created and shared their own self-portraits in an exhibition, was highly successful with an audience that was comfortable expressing themselves as individuals. If visitor participation sounds overwhelming, or if you are uncertain of its utility for your audience, ask them. 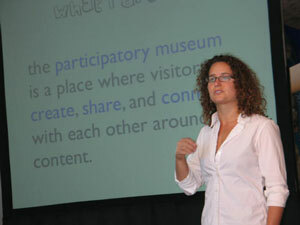 What would visitors like to share relative to their museum experiences? What kind of social opportunities are they not able to create for themselves? What do they wish they could respond to, and what are they happy to consume without comment? By engaging with visitors institution by institution, community by community, participation can shift from something vast and unknowable to something easy to perform and valuable to visitors and institutions alike. Nina Simon is the author of the Museum 2.0 blog and the new book, The Participatory Museum, which will be available in March. Thank you Nina – as a Pacific person who works within a Museum in a location where I am surrounded with people who are keen for connection, you and your findings only validates what i ahve always pushed for. I know this becos I do it for randomly for visitors, friends and family who are wowed by the information shared and the personal connections made(becos, I got to talk with them prior and throughout their visit). Great blog Nina, I found connection with your visit to Seattle, Chinatown “Living Legend”.